The concept of self defense for seniors deals more with not showing fear than with ways to body-slam someone to the pavement. Strength to protect oneself comes from an awareness of surroundings, a fearless presence, and an understanding of your capabilities. Most self defense professionals urge people to avoid needing to defend themselves by avoiding situations which may promote crime. Wearing flashy jewelry, carrying expensive handbags or briefcases, or counting cash at an ATM may be all the motivation a criminal needs to target you. Staying aware of your surroundings is particularly important as your vision, perception, and hearing decline. Get into the habit of frequently scanning your surroundings, which will help avoid trouble. This situational awareness helps you realize when someone is watching you a little too closely or is trying to sneak up on you. The best self defense is to avoid physical altercations altogether. Use de-escalation techniques to turn a situation around before it gets physical. Commanding words, spoken loudly, can make a would-be criminal rethink their plan. Remember, most criminals want an easy target and seek meek victims who will not put up much of a fuss. Here is a script for an altercation, turning it into a moment where you take command and don't allow the other person to choose you as a victim. Stranger: All I want is $20 dollars, lady. Senior woman: (very loud and confident) No! Go away! It's important to note here that the fear of being impolite shouldn't stop the woman from asserting herself. If she feels threatened, her words and demeanor are justified and self-protective. Stranger: What's the matter with you, lady? You don't want to help a guy out? Senior woman: No! Go Away! (She does not turn away from him but holds her stance or backs away from him, never losing sight of his position). If a situation turns physical, fight back with vigor as if your life depended on it (it might). You don't need fancy self-defense techniques in order to defend yourself in an attack. Remember this: the eyes of a body builder and the eyes of a petite person are equally vulnerable, so they make excellent targets in an altercation. Using your fingers, jab at the attacker's eyes quickly and repeatedly. The throat and the groin (for men) are also good targets, but jabbed eyes may incapacitate your assailant long enough for you to get away. When attacked, repeat these words to yourself: "Eyes, eyes, eyes, eyes!" Focus on poking the eyes as many times as it takes to get the attacker to stop. If your hands are being held and you can't poke the eyes, stomp hard on the attacker's foot. The jolt of pain may compel him to let go of one or both of your hands, and that's when you go for the eyes. If an attacker is determined to take your purse or wallet, let them take it. Resisting means you have to engage in a fight, and you can't know what the attacker is willing to do. If you're met with a menacing, "Give me your wallet" from a knife-wielding man, throw the wallet away from you and get away as fast as you can. While you may lose some cash and have to put a freeze on your credit cards, at least you didn't wind up in an ambulance. During any altercation, your goal should be to get away; it isn't to teach the attacker a lesson or hold him in place until police arrive. Self-preservation is of the utmost importance, so if your attacker is doubled over rubbing his injured eyes, this isn't the time to deliver a swift kick to the groin. Instead, it's the opportunity to get away as fast as you can, keeping in mind the attacker may pursue you (or may have buddies nearby waiting to pursue you), so situational awareness is vital here while you flee. A weapon isn't necessarily a gun or a knife. Keep in mind almost anything can be used to inflict harm: keys, an umbrella, a pen, a cane, and even canned food from your shopping bag. If you must use one of these items to defend yourself, think of where it will have a real impact. For example, smashing a can of creamed corn across the bridge of the nose is more effective than throwing it at the attacker's stomach. A pen or key jabbed in the eye is better than a poke on the arm. Senior self-defense experts generally recommend you not carry items such as tasers, knives, guns, and, by some opinion, mace or pepper spray. The attacker could easily use these weapons against you. Call your police station and see if they offer self-defense classes at a YMCA or a senior center. Many municipalities host classes as a public service. Local martial arts facilities often have a self defense for seniors class. If not, ask if there's a self-defense course for women, which will still arm you with methods of protection. FullPower International is an organization that teaches self-defense classes. It isn't available in many states in the U.S., but they offer to be a helpful resource to finding classes near you. There are a variety of videos and DVDs that teach self-defense as well. Based on the principles of tai chi, these methods enable you and a partner to practice on one another. SI Video is a good source of self-defense media. There is one important psychological factor to remember regarding self-defense. 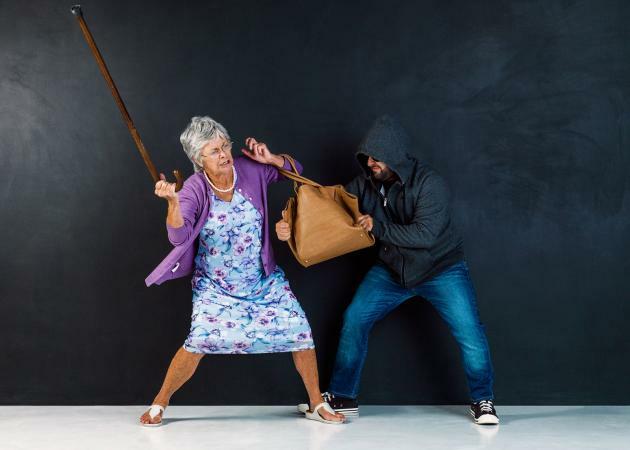 Learning about self defense for seniors is not because you are old and feeble; you are strengthening yourself and becoming more prepared. Don't deny yourself an opportunity to improve your well-being simply due to a perception, because that's exactly how an attacker wants you to think.